The review of the product Hair Growth Formula which has been manufactured by Planet Ayurveda is stated as follows. The manufacturer of this product claims that there is a perfect combination of herbs in this product which makes it very effective in treating hair loss as well as the underlying conditions that cause it. Read on to learn more about the ingredients of this product as well as our opinion of whether it is the right product to take for the health of your hair. It is recommended that adults take two capsules of this product daily, about half an hour after a meal with plain or lukewarm water. The price of one bottle of this product is listed as $28.95 on the company’s website and includes 60 vegetable capsules which are enough to last a full month. However, you are required to purchase at least two bottles and the manufacturer offers you a discount of $14.95 on the purchase of two bottles. The manufacturer of this product does not offer any kind of guarantee and this is an area of concern because if it doesn’t show the desired results then you have no way of getting your money back. There are also no reviews on the company’s website which makes it a questionable purchase. 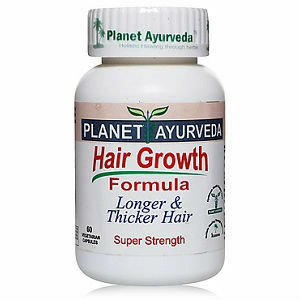 Hair Growth Formula by Planet Ayurveda is a hundred percent natural supplement that has been designed to address hair loss as well as the problems like stress, hormonal imbalance, side effects of medicines, poor nutrition, thyroid disease and genetics that cause this hair loss. It can improve the circulation of blood to the scalp and reduce the amount of DHT from the hair follicles and thus prevent the hair loss and encourage the growth of new hair. It is also free from gluten, artificial colors, preservatives, chemicals, yeast and starch so it can be used by vegans and vegetarians. However, the fact that the manufacturer has not given any money back guarantee and you are forced to buy at least two bottles of this product makes it a tricky choice. There are also no reviews of this product on the company’s website so the bottom line is that this may not be the perfect supplement for you. John Brownstone	reviewed Planet Ayurveda Hair Growth Formula	on July 29th	 and gave it a rating of 2.5.